DOLPHINS ARE SPOTTED REGULARLY. Some guests have even had the luck to swim with them. We are careful to follow the "Code of Conduct" to ensure the dolphins are not chased, harassed, or put under stress. Some divers have also been lucky enough to see whales and whale sharks. Two dives will be done in the morning, giving you a chance to enjoy a sumptuous late lunch. INTRODUCTORY DIVES are offered for those who have never tried diving before. You will have the chance to do a dive with an instructor to a maximum depth of 8 metres after receiving a detailed briefing. This will give you the opportunity to see just how easy, safe and enjoyable diving can be for everyone! 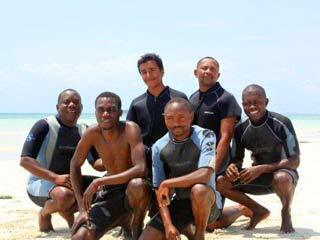 Spectacular diving is offered for all levels of divers. Beginners will enjoy the supervision of an experienced PADI dive instructor and will be astonished by the wealth and diversity of marine life. Our water temperatures vary from 24-26 degrees Celsius July- Sept and 26-30 degrees Celsius Oct-Apr. 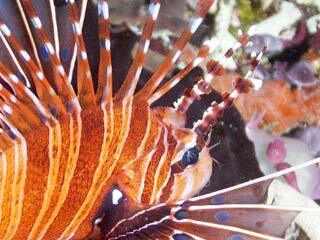 What makes our area so interesting is the sheer variety of marine life, each diving site having its specialities. There are deeper dives are for larger predatory fish and shallower ones for an abundance of hard and soft corals and large, diverse selection of fish species. Other dives are special for macro photography, well camouflaged creatures and the weird and wonderful! 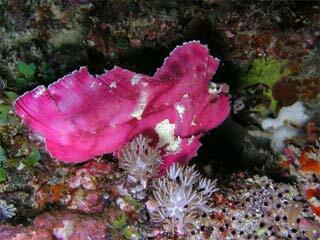 Nudibranchia (sea slugs) are given little importance by the average snorkeler or diver. They have various shades of purple, red, blue, green and yellow, a warning to predators that they are noxious or even toxic; their colour also helps them hide themselves by use of camouflage. Chemical warfare is the weapon of choice for many; some secrete acids which produce a sensation found to be distasteful by fish. Others secrete toxins so powerful that a nudibranch placed in a bucket with fish or crabs will kill them in about an hour! They are also hermaphroditic - that is having both male and female reproductive organs present in adult specimens and when they lay eggs they form a beautiful frock like pattern.